Ukrainian Christmas Eve is not only very rich in traditional foods prepared freshly that day, and shared by the family during the Christmas Eve 12 course meatless dinner, but also myriad of traditions are practiced before and after the meal. This holiday was a lot of fun for children in the olden day, especially village children, as they had more freedom to frolic in the straw and hay brought into the home, and strayed over the floor and on the dinner table. This was done to experience the nontraditional environment Mother Mary and Joseph faced that night, as they were searching for a place for Mary to give birth to baby Jesus. Once the meal was ready, the children were asked to watch the sky for the appearance of the brightest star, which was a sign that Jesus was born. At that time the head of the household, normally the father or the grandfather, would bring into the home a beautifully arranged sheaf of wheat, and greet the whole family with a special Christmas greeting. The sheaf on wheat would then be placed in the corner of the dining room. Nowadays, we usually have a flower arrangement with wheat stalks, or a dainty, miniature sheaf of wheat tied neatly with a red ribbon, and displayed in the home. 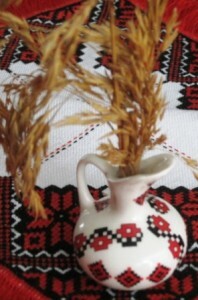 The above displayed picture of a miniature Ukrainian Ceramic Vase with Oats stalks, is my family replica of this Christmas tradition. These Oats were grown on my Grandfather’s farm in Europe, and brought here on my last family visit. A sheaf of Oats, rather than a sheaf of Wheat, was our family tradition for Christmas Eve. The sheaf was present in our home until the Jordan Water Blessing Day (Epiphany/Theophany), after which time it was sprinkled with the freshly blessed water brought from church, and given to the farm animals to consume. Also, the oats seeds were pulled off the stalks on New Year’s Day, and sprinkled at relatives homes, by the youngest boy of the family, visiting and greeting them with a special New Year’s greeting, to bring prosperity, health and good luck, in the new year. He would be rewarded with tasty baked goods, and money. In the city, these traditions were not possible to follow, due to small living space, so a handful of hay was placed in the middle of the table, or under a freshly pressed, pure white table cloth, rather than strewn all over the floor. Kolach, a special bread adorned with a burning candle, takes the center stage on the dinner table. Picture of this kolach was taken at a cultural display during a Ukrainian Festival in PA, prepared by an unknown to me contributor. On the other side of the Kolach is a dish of honey, accompanied by chunks of bread, and peeled cloves of garlic (I use chopped garlic in flax seed oil). Our family display also includes a special Christmas Eve wafer (Oplatek), normally used by Roman Catholics to share on Christmas Eve. These wafers are presented to us by members of our family who also practice Roman Catholic traditions, as this unites us all together at least in spirit, on Christmas Eve. This special arrangement is passed around the table and shared by everyone, right after we finish our before meal prayer, and greet everyone with a special greeting “Khrystos Narodyvsia” – Christ Is Born, with an appropriate reply “Slavyty Yoho” – Glorify Him. Another very important item for that evening is the Kutia. 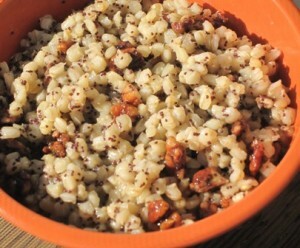 A whole wheat grain dish, cooked and flavored by honey, poppy seeds, walnuts, and raisins. In the past, the head of the household, would take a spoonful of the Kutia and toss it toward the ceiling, and the more of the grains that stuck to the ceiling the more bountiful the future crop would be. This tradition died out over the years, for practical reasons of course. 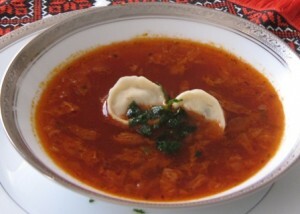 Next dish served is the Christmas Eve Borscht with Vushka. 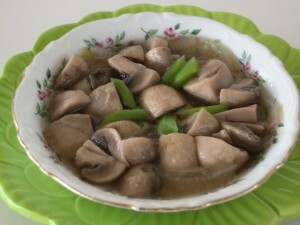 These special traditional foods, are followed by, several different fish dishes, including pickled herrings, a must at Christmas Eve. Next you will be served varenyky (pierogi) with various fillings, holubtsi (cabbage rolls) with rice/mushroom filling, or buckwheat filling, mushroom gravy, cabbage with beans, other bean dishes, pickled mushrooms, kompot (compote -cooked dried fruits drink), jelled fruit dish, and a nice selection of baked goods. 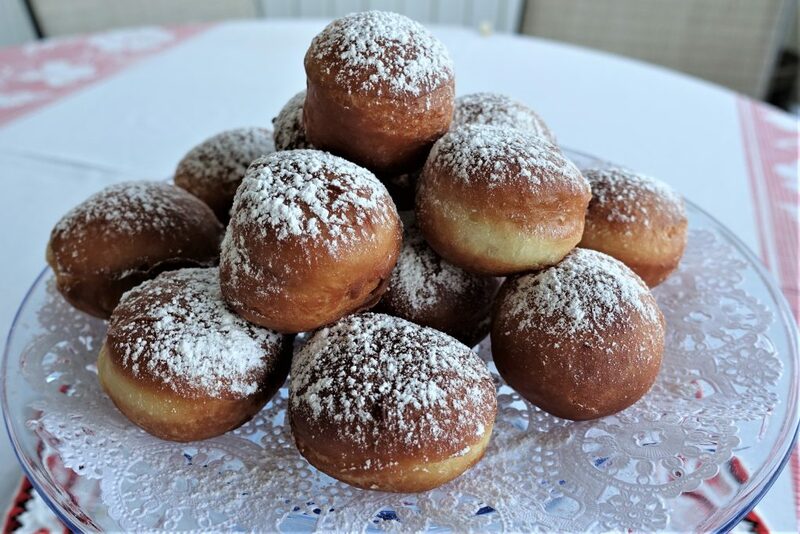 Pampushky (homemade donuts), were always my mom’s favorite dessert, prepared just before Christmas Eve dinner, so they were very fresh, and absolutely delicious to enjoy after the meal. I also have a quicker recipe for doughnuts if you rather try that one. After dinner, the whole family gathers around around the Christmas Tree to sing Christmas Carols (Kolady). Ukrainians normally do not exchange gifts on Christmas, since they already received gifts from St. Nicholas on December 6th, but in the Diaspora, the children receive small gifts from St. Nicholas, and then again additional gifts are exchanged on Christmas Eve, after dinner and caroling is all done, but before the midnight liturgy, which everyone is obligated, and encouraged, to attend. Khrystos Rodyvsia – Slavite Yoho! Thank you so very much for the above. 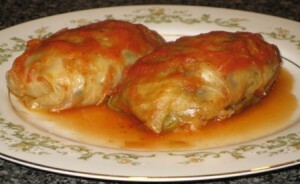 If you are not Ukrainian, you just learned about our Christmas Eve tradition. 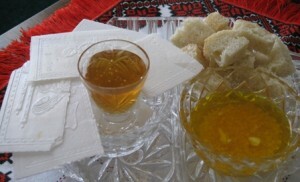 I find it very interesting to learn about traditions of all nations. Sometimes you will find that we are not so different. Merry Christmas and may the year 2012 bring you even more of what you are wishing for. God Bless. I do have fun sharing my own Ukrainian Christmas Eve traditions, and would love to hear from others about their traditions. Please share. What a wonderful way to spend Christmas with your family. Your aunt will be delighted to say the least. Veselych Sviat to you ALL. This post probably took HOURS to prepare, but it is very much appreciated. There is so much in it that reminds me of the beautiful Christmas Eve celebrations my family enjoyed on the farm! Thank you so much Eleanor for reading my post, and taking the time to leave a comment. I also visit your blog from time to time, just to check what you are up to…:-), and enjoy reading about your family recipes and stories. Keep up the great work. Enjoy your Christmas celebration with your family.